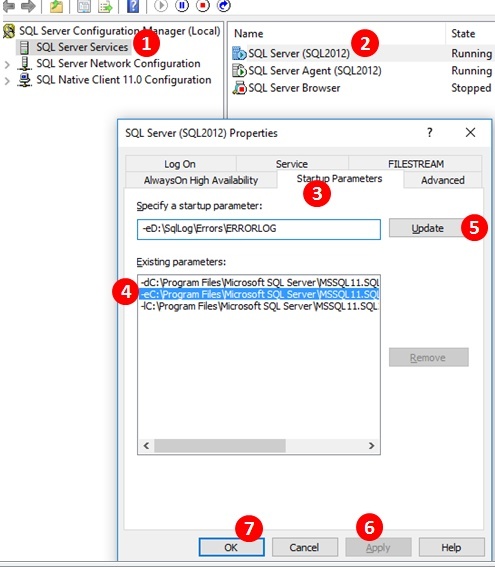 Once the Sql Server Configuration Manager is opened, then follow the Steps in the Sequence as listed in the below image to change the Sql Server Error logs Path. Below is the description of each of the sequence of steps which we need to follow in the Sql Server Configuration manager to change the Sql Server Error Log files location. In the right pane right click on the Sql Server Instance Service and in the context menu click on the Properties option. The path after the prefix character -e is the current error logs path. Change the path to the desired location. In this case I am changing the current Error Logs location to -eD:\SqlLog\Errors\ERRORLOG. And then click the update button to update the error logs location. Now the changes to the error logs location are saved but they are not still-in effect. If you want these changes to take effect, you need to restart the Sql Server Service. Note: Any mistake in this startup parameter path will result in failure to start Sql Service once service or the server restarts. And you will come to know about this issue only after making this change and after restarting the Service. Please make sure you are taking into consideration the following points while changing the Sql Server Error Log location. Make sure that the new folder location which you are specifying should already exists.